Sen. Mae Beavers, R-Mount Juliet, concludes remarks on the Senate floor in Nashville on Wednesday. Beavers' proposal calling for the popular election of the state's attorney general fell short of the votes needed to pass the upper chamber. Gov. 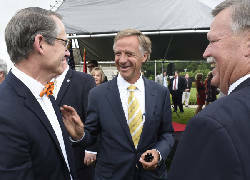 Bill Haslam, center, talks with Tennessee State Senator Bo Watson, left, and Hamilton County Mayor Jim Coppinger. Tennessee Gov. Bill Halsam signed the IMPROVE Act Bill at the Tennessee Welcome Center in East Ridge, Tenn. on June 4, 2017. NASHVILLE — Republican Gov. Bill Haslam on Monday questioned a pledge by state Sen. Mae Beavers, a GOP lawmaker who hopes to succeed him, to work to repeal Tennessee's recently passed gas tax if elected next year. "If you want to repeal that, how are you going to pay for road improvements?" 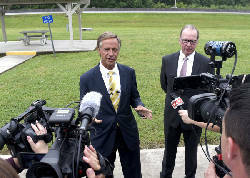 Haslam asked reporters in Nashville on Monday afternoon as he held one of several ceremonial signings around the state on the IMPROVE Act, which raises gas and diesel taxes for roads and bridges while simultaneously cutting non-highway taxes by an even larger amount. "Are you going to take the tax cuts that we made off the table too?" Haslam said of the reductions, which include a 20 percent cut to the state sales tax on food sold in grocery stores beginning July 1. "You know, one of the things I've always said is, whoever it is, you say I'm going to do this or do that. But at the end of the day, the math has to work." Beavers, a hard-right Republican from Mt. Juliet who voted against the IMPROVE Act, last week declared her candidacy and pledged "a full effort to repeal the gas tax increase that the legislature just passed and Gov. Haslam just signed into law." During her formal announcement speech on Saturday, Beavers told attendees that "just last month, the people of Tennessee rose up as one and told their elected leaders 'No' to a gas tax increase. Did they listen? No, they didn't listen to you. "But during the next 14 months, they are going to listen to you, because you and hundreds of thousands like you are going to rise up again as one and make your voices heard." "For too long, you have been overtaxed by billions of dollars because taxes have been raised," Beavers said. "No more! I am committed to rolling back these immoral taxes and restoring fiscal responsibility in our budget." Haslam, who is term limited and can't run for a third term in 2018, said if the fuel tax increases, which raise gas and diesel by 6 cents and 10 cents per gallon, respectively, over a three-year period, were to be repealed, "we have to go back into the budget and say are you going to take out the tax cuts or not do the road improvements. "Or," Haslam added, "what else are you going to take out of state government to pay for it? It's a simple math question." Asked whether Beavers raising the issue may prove a winning issue politically, Haslam said, "Well, it might be. But then again, one of the charges of leadership, whether you're a legislator or a governor, is to say 'I've got to make this budget work.' And we've been able to run the budget in a way that by the time it's all done [the state will] have cut $800 billion in taxes and addressed our infrastructure needs. "I think that's what this state wants us to do," the governor said. 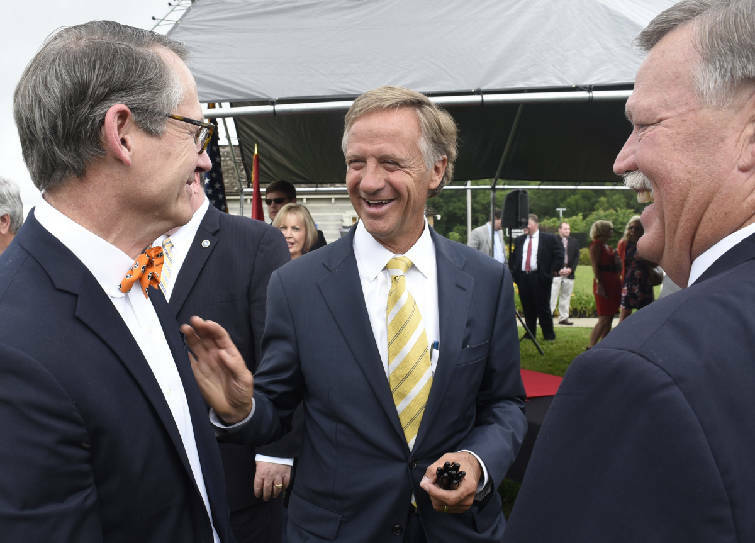 Beavers is one of three announced Republican candidates in the 2018 governor's race, the others being Knoxville businessman Randy Boyd, a former state economic development commissioner in the Haslam administration, and Franklin businessman Bill Lee. State House Speaker Beth Harwell, R-Nashville, who sought unsuccessfully to derail Haslam's gas tax plan in the lower chamber, is in the midst of deciding whether to run, as is Senate Majority Leader Mark Norris, R-Collierville, who successfully pushed Haslam to make the IMPROVE Act's tax cuts larger than the fuel tax increases. Former Nashville Mayor Karl Dean has announced he is running in the Democratic primary. State House Minority Leader Craig Fitzhugh, D-Ripley, is actively exploring a bid, as well. This story was updated June 5 at 11:20 p.m.